Senator T. E. Barker, Senator I. G. P. Gooding-Edghill, Senator F. J. Stuart and Senator Sir John Stanley Goddard, K. A. Senator the Hon. 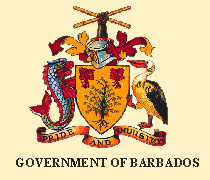 E. R. Griffith: To move the passing of a Resolution to approve the guarantee by the Minister of Finance of the payment of the principal sum of 16 866 000 Dollars in the currency of the United States of America and interest thereon to be borrowed by Caves of Barbados Ltd. from the Caribbean Development Bank to undertake the project to redevelop Harrison’s Cave. Notice of this Resolution was given on 13th June, 2007. Senator the Hon. E. R. Griffith: To move the passing of a Resolution to take note of and to endorse the Industrial Policy for Barbados’ Manufacturing and Related Services Sectors 2007-20 12. Notice of this Resolution was given on 20th June, 2007. Senator the Hon. E. R. Griffith: To move the First Reading of the Severance Payments (Amendment) Bill, 2007. Notice of this Bill was given on 27th June, 2007. The Bill first appeared in the Official Gazette on the 4th June, 2007. Senator the Hon. E. R. Griffith: To move the passing of the Resolution to approve in accordance with section 5 of the Crown Lands (Vesting and Disposal) Act, Cap. 225 the vesting in the National Housing Corporation of parcels of Crown lands situate at Westbury Road, in the parish of Saint Michael in this Island for the purpose of housing development. Notice of this Resolution was given on 27th June, 2007. Resolution to approve in accordance with section 5 of the Crown Lands (Vesting and Disposal) Act, Cap. 225, the vesting in the Caribbean Development Bank of parcels of Crown lands situate at Wildey, in the parish of Saint Michael in this Island to facilitate the expansion of the headquarters of the Caribbean Development Bank. Senator the Hon. E. R. Griffith: To move the passing of a Resolution to approve the grant of a lease under section 5 of the Crown Lands (Vesting and Disposal) Act, Cap. 225 of a parcel of land, the property of the Crown, at Saint Lawrence Gap, Christ Church in this Island to Sapphire Inc.